MIKIC Residence — Jeff Svitak Inc.
A city house, surrounded by nature. The location of the house, resting at the end of a small cul-de-sac, and perched among the ridgeline of a canyon, sets the scene for a slow departure from the city experience into an environment enveloped by nature. The narrow approach to the house is subtle and understated. A two-story volume with one window looking out and a single story wall with landscaping in front are all that is seen from the street. The entrance lies just beyond the front wall and through a semi-hidden passageway where the entry gate can be found. Once through the entry gate, a small private courtyard is discovered, which opens itself to the various programmatic areas of the house. 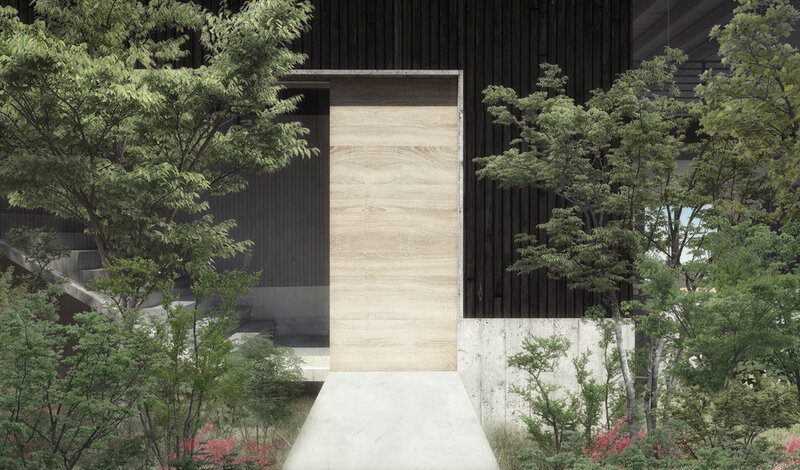 A large sliding door opens up to the office, a turning outdoor staircase leads to the guest quarters, and a covered concrete bridge with a roof garden above serves as the approach to the main house. Moving along the entry bridge, a dense natural garden setting is found just in front of the entry door to the house, leaving a slight moment of pause for the senses to acclimate. Once inside, a small staircase leads down and the main living spaces of the house are unveiled, opening up dramatically to the view of the canyons surrounding the site. The volumes and spaces of the house are simple and elegantly crafted for the site topography and take full advantage of the views to existing natural elements. The basic two tone materiality, consisting of board formed concrete bases and thin vertical wood siding boxes on top, is meant to become a backdrop for the landscape, and to quiet the visual appearance of the architecture within its setting.